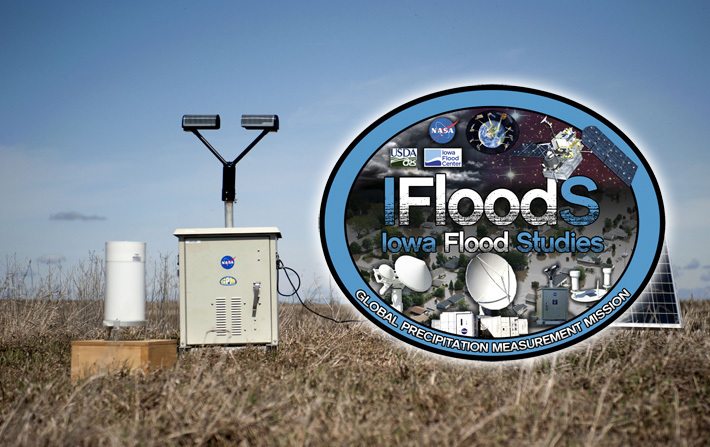 The Iowa Flood Studies (IFloodS) are a ground measurement campaign taking place in eastern Iowa from May 1 to June 15, 2013. The goals of the campaign are to collect detailed measurements of precipitation at the Earth's surface using ground instruments and advanced weather radars and, simultaneously, collect data from satellites passing overhead. The ground instruments will characterize precipitation -- the size and shape of raindrops, the physics of ice and liquid particles throughout the cloud and below as it falls, temperature, air moisture, and distribution of different size droplets -- to improve rainfall estimates from the satellites, and in particular the algorithms that interpret raw data for the upcoming Global Precipitation Measurement (GPM) mission's Core Observatory satellite, which launches in 2014. 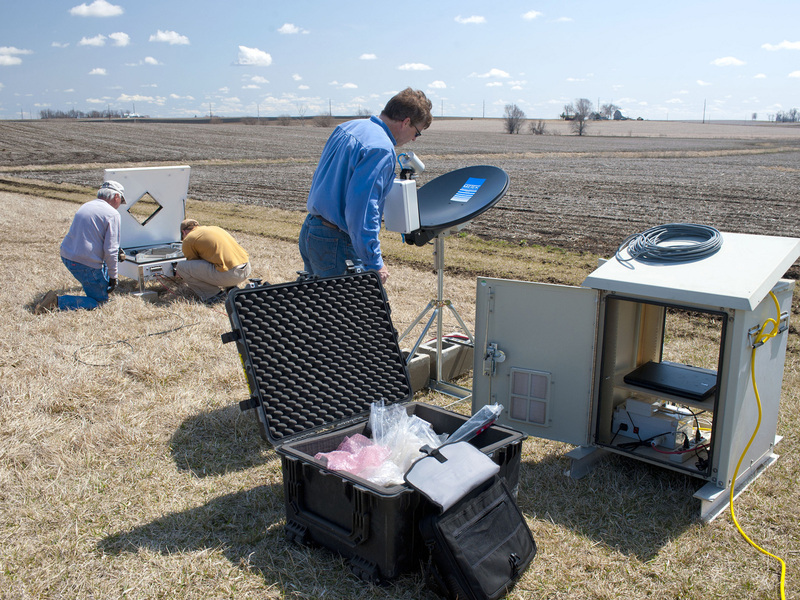 NASA and Iowa Flood Center staff install instrumentation in eastern Iowa for the IFloodS campaign. In addition, the precipitation data collected will be run through flood forecasting computer models in an effort to improve capabilities and to determine the extent and limitations of satellite precipitation data for flood forecasting. NASA's GPM ground validation team is partnering with the Iowa Flood Center at the University of Iowa to run this study. Dense instrumentation covers the ground in clusters along a corridor within the Cedar and Iowa river basins between Waterloo, Iowa, where NASA's advanced radars are deployed, and Iowa City. Other ground instruments are distributed throughout northeast Iowa in the Turkey river basin. One large NASA NPOL radar will be stationed near Waterloo and additional instruments for measuring rainfall will be placed in the following eastern Iowa counties: Benton, Blackhawk, Hamilton, Hardin, Iowa, Linn, Marshall, and Tama. A network of rain gauge and soil moisture platforms in coordination with the Agricultural Research Service and NASA Soil Moisture Active Passive (SMAP) community will be deployed. 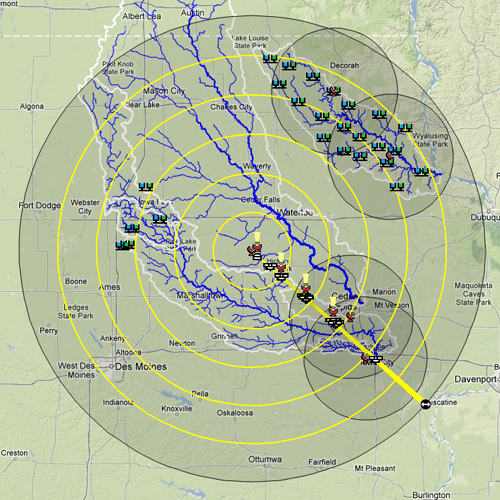 The Turkey River Watershed has been identified as the study area for a uniform deployment of 20 rain gauges with soil moisture probes and two Iowa Flood Center XPOL weather radars.